You play as sixteen-year old Chloe Price who forms an unlikely friendship with Rachel Amber, a beautiful and popular girl destined for success. When Rachel learns a secret about her family that threatens to destroy her world, it is her newfound friendship with Chloe that gives her the strength to carry on. 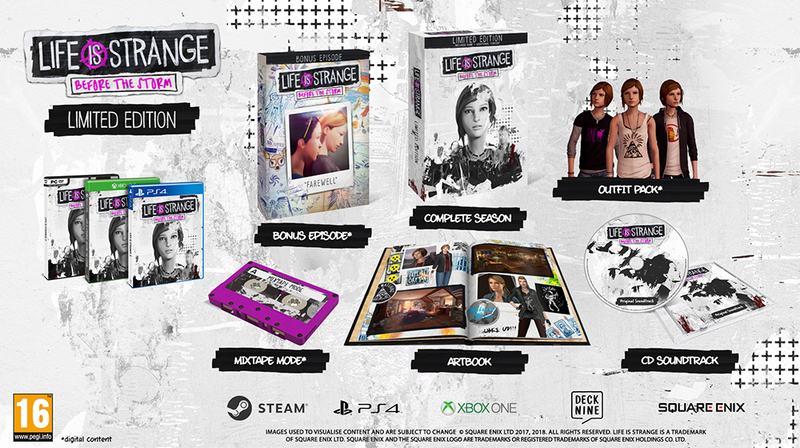 Exclusive artbook featuring art from Life is Strange: Before the Storm. The original soundtrack on CD. Mixtape Mode - Design your own playlist from the Life is Strange licensed soundtrack and listen to it alongside a cinematic scene from the game. Outfit pack - Change up Chloe's look with three new complete outfits. Includes Punk Doe, Hawt Dawg Man & Illuminati outfits. Episode 1 from the first Life is Strange season.